What if schools led professional development that inspired teachers and students to be active partners in the sustainability movement? We are Environmental Charter Schools — a network of three public schools in South Los Angeles that use the environment to engage students and connect them to the wider world. Part of our work includes helping to reframe “green” and “sustainability” across all disciplines as questions of equity, justice, and identity to make environmental issues relevant to our students’ daily lives. Our success as a green school is due in part to strong partnerships with organizations, businesses, and policymakers in our region. Collaboration with partners is a key pillar of our five Best Practices. 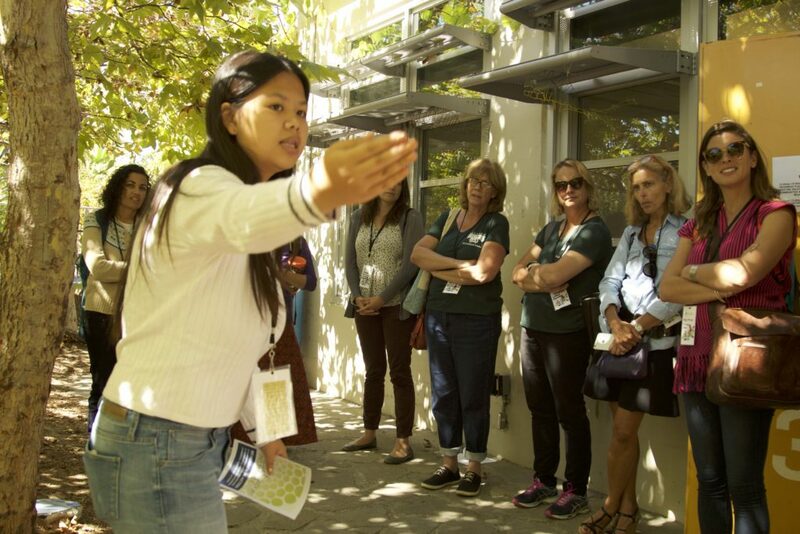 Through the Green Ambassadors Institute — our professional development learning lab for educators and organizations interested in implementing hands-on sustainable education — we connect teachers and students with leaders in the environmental movement in Los Angeles to expand the curriculum beyond the classroom. Each year, we bring together educators in formal classroom and out-of-the-classroom settings for a series of summits and field trips to engage with the environmental issues of greatest significance to communities in Southern California — water conservation, water quality, climate change, air quality, open space conservation, and urban community health. The 2016-2017 theme of ‘Research in Action’ kicked off with a daylong summit exploring ways to address local environmental issues through community-led research. A keynote presentation by Floridalma Boj Lopez, a doctoral candidate at the University of Southern California’s Department of American Studies and Ethnicity, highlighted the hands-on research produced by the latest cohort of the Marina Pando Social Justice Research Collaborative, a program of East Yard Communities for Environmental Justice. During her keynote presentation Boj Lopez underscored the difference between environmentalism and environmental justice. Often, she said, mainstream environmental organizations do not address the environmental issues that most greatly affect low-income communities of color, such as toxic pollution, food apartheid, and air quality. Green schools can create a school culture that consciously provides space for young people to lead research and advocacy work — from the perspective of any academic discipline — that actively addresses the environmental justice issues most impacting their communities. A key take-away from the summit was that everyone, including and especially first generation college students, can be scholars and technical experts in their communities. The Green Ambassadors Institute strives to be a regional hub for environmental service-learning curriculum and content, as well as a catalyst that brings K-12 schools and community leaders together as equal partners in developing authentic solutions to environmental challenges of the 21st century. Sailing on the Pacific Ocean with 5 Gyres and the Los Angeles Maritime Institute to research the impact of plastic pollution. 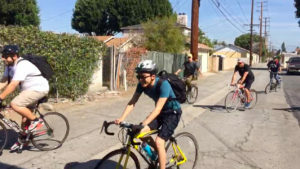 Riding bikes through LA’s streets with the Los Angeles County Bicycle Coalition to imagine the future of transportation in an urban landscape. Strolling through downtown Los Angeles with the Los Angeles Conservancy to explore the city as a model for sustainability. The final workshop in the series takes place on May 6 where students and educators will showcase innovative ways they researched environmental issues in Los Angeles and took action. To register for these sessions, visit the Green Ambassadors Institute website or email Sammy Lyon at sammy_lyon@ecsonline.org with any questions. To watch the full keynote presentation by Floridalma Boj Lopez, please click here. You can also watch last year’s keynote speaker, Dr. Laura Pulido, who provided a framework for environmental justice work through history, data, and case studies. Sammy Lyon collaborates with students and teachers to imagine and implement solutions to the challenges of our generation. Sammy leads the Green Ambassadors environmental service-learning program at Environmental Charter Schools in Los Angeles, offering professional development for educators and organizations looking to implement hands-on sustainable education. The 2016-2017 Green Ambassadors Institute team includes educators, partners, students, and school administrators.